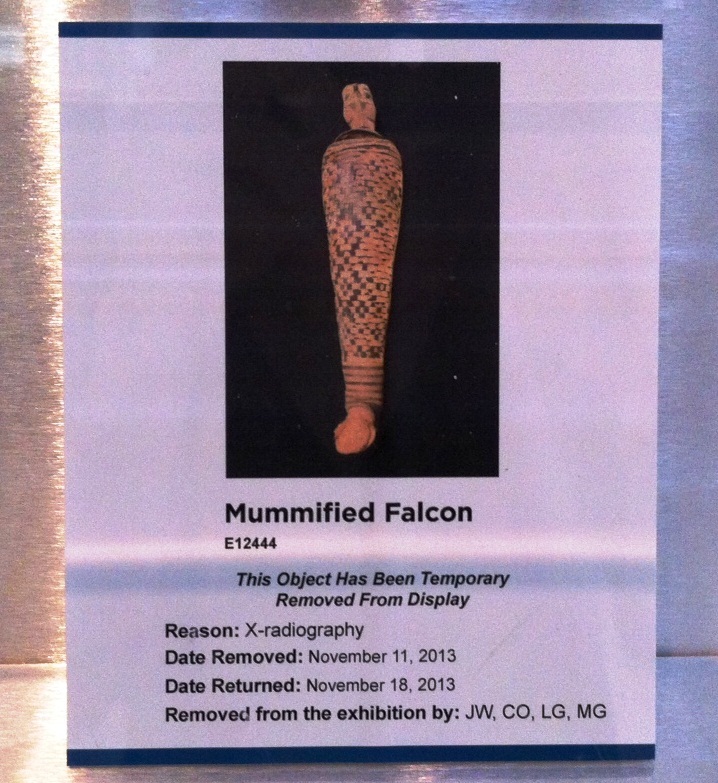 As indicated on the sign, the falcon has been removed for x-radiography. This mummy has never been x-rayed before, and we’re interested in using this imaging technology to learn how it was made and if there are any falcon remains inside! Along with the falcon, we’re also going to be x-raying/CT-scanning our (possibly headless) cat mummy, the wooden statue heads, and several other pieces. We do not have the ability to x-ray and CT-scan objects here in the museum, so we will be taking these selected pieces for a little trip tomorrow. In preparation for their travels, they are securely packed, and ready for this exciting excursion! 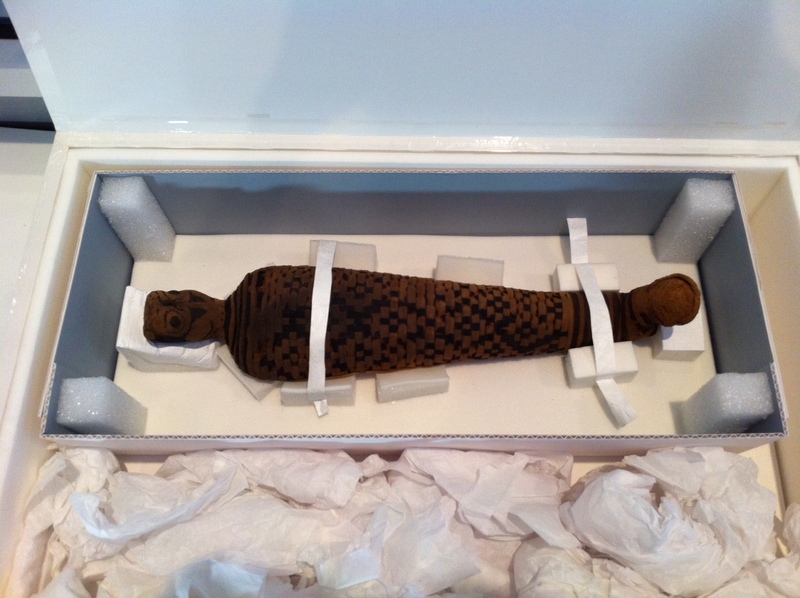 The falcon mummy is secured inside its storage support and packed into a larger box for travel. We will update the blog with our findings soon after we return. This entry was posted in Animal Mummies, examination, Mummies, Objects In the Artifact Lab and tagged animal mummies, cat mummy, CT-scan, CT-scanning, falcon, moving collections, wooden heads, wooden statues, x-radiography, x-ray by mollygleeson. Bookmark the permalink. Christian – if you mean did the falcon suffer damage during its trip or the x-ray (and CT scan), the answer is none. He was carefully packed up and handled only by the Conservation team during his adventures. He even withstood the vertical stance he needed for his CT scan very well; we’d worried a bit about that but were delighted with the results. Now, damage before mummification and after excavation are a different story. We still haven’t had a chance to have our faunal specialist really examine the x-rays and CT scans but the bones look pretty messed up to us. It’s possible the falcon was cut apart before mummification to make a better mummy shape. For more on his post-excavation condition, check out the previous blog posts on him by clicking on ‘falcon’ in the word cloud to the right of the blog text. How much damage is on the falcon? I like the blog did anything ever fall apart while you were working on it.